No better time to learn about the weird and wonderful: how Excel measures stuff. If you have ever tried to fit your spreadsheet columns to fit exact measurements in inches or centimetres and have failed before, this short post explains measurement units in Excel and why you will (almost) always fail. How wide is a column in Excel and how can you resize it to a specific width? Select a cell and go to the Home tab, Cells group and click Column Width in the Format dropdown. The column width dialog displays the standard column width of 8.43. You can type a new value to resize the column, naturally, but what does 8.43 represent? The column width is measured in characters, i.e. the default column width fits 8.43 characters. Not bold, italic, big or small characters: this measure is based on the default font used in the workbook (press CTRL+1 to open the Format Cells dialog then click the Font tab). This measure is converted internally by Excel to the nearest multiple of 8 pixels, which is the display unit commonly used and understood by your computer. For that reason, some widths you type will be automatically changed by Excel. I have just tried 8.9 and Excel changed it to 8.86 when I clicked OK. Confusing? Somewhat. At least now you know why. So if you fancy using Excel as your canvas to let your creativity flow and create great Excel art your starting point is the square gridline: select all the columns in your workbook that you wish to resize and in the Column Width dialog box above, type: 2.41. 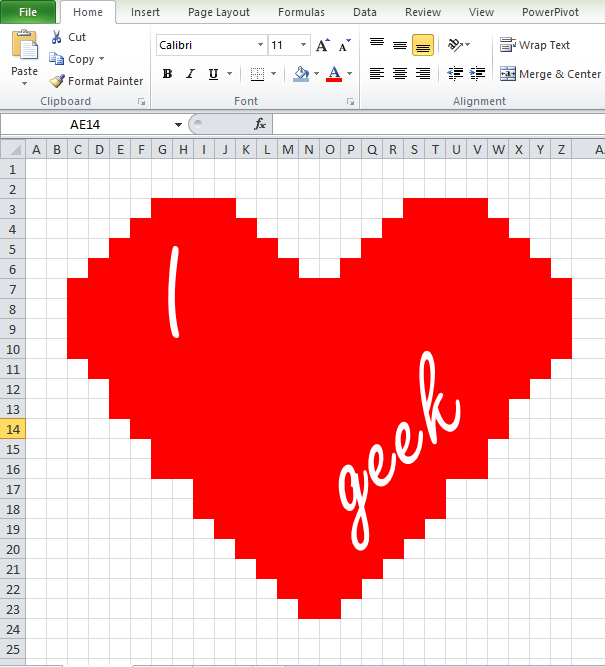 PS: About your Valentine today… go get them some chocolate or roses, spreadsheets don’t really cut it apparently! PPS: If you must, here’s more about column widths.